Just handed my mother a cheque for the final payment on our apartment. With that, it feels truly good to head into 2011 completely debt-free. Becoming a homeowner is one of those major steps in life that makes one feel like one is well and truly an adult. My blog probably gives some people the impression that I'm a profligate shopaholic but actually I have always saved a significant portion of my income. And yes, even my mother was surprised that I actually have managed to save so much! It feels amazing to finally accomplish this after ten years of working. Speaking of which, I'm always slightly puzzled when people ask how I can afford to shop so much. I would have thought that the answer was obvious: I work for it! No silver spoons, no sugar daddies/rich husbands, no fancy investments. I just worked and saved. What I've accomplished though is nothing compared to my mother. My father left us before I was even one year old and she raised my brother and me single-handedly through sheer grit and determination by working as a facialist and a hairdresser. She didn't have a rich family and she left school at 16 to support her family. At one point, we were so poor that we had all of 60 cents in the house! If you saw her on the street, she would probably just look like any humble old lady to you but to me, she's still the most inspiring person in my life. View from my bedroom window with the port lights in the distance. 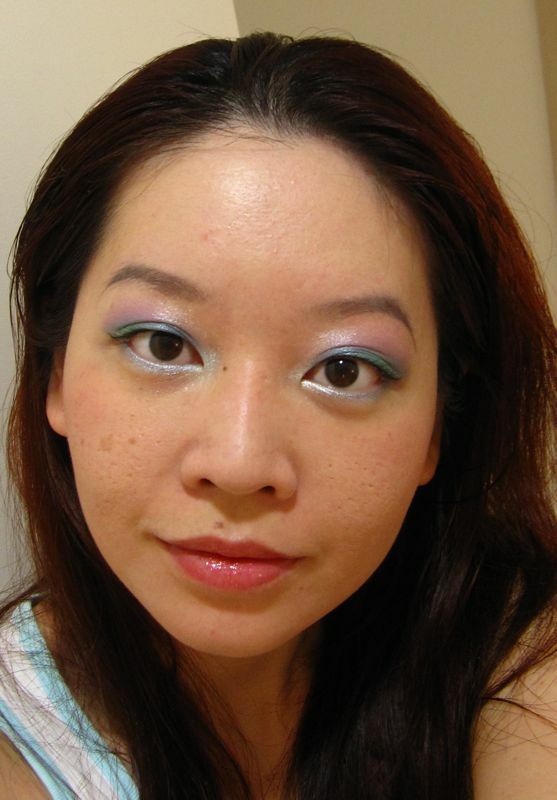 Today being the final day of 2010, I was in the mood for a fun, light-hearted look. 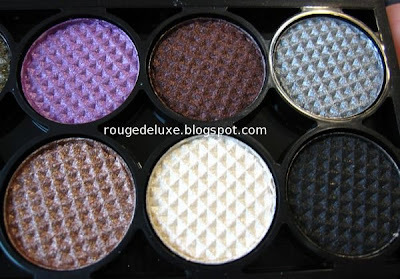 The shades that I used in the Sleek Curious i-Divine Palette are marked with an "X" in the pic below. 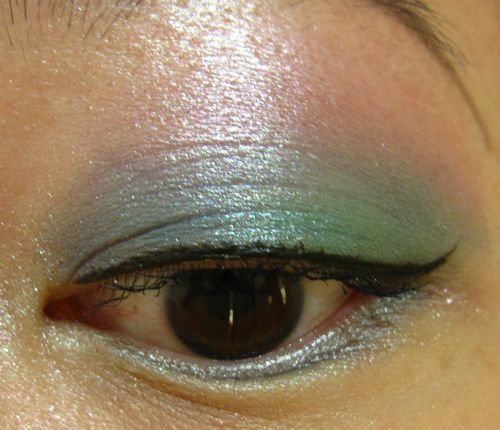 Using Beauté de Kosé Eye Fantasist GR751 Dew Green as the base, I applied the sky blue shade from the inner corner to the middle of the upper lid, the teal shade from the middle of the lid to the outer corner and the purple shade blended into the crease. 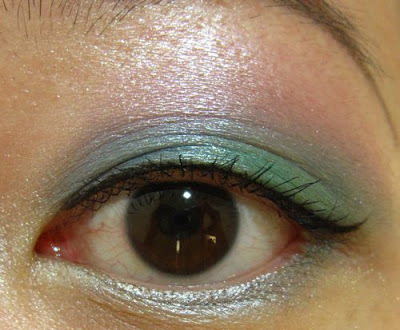 Next, I used the light beige shade as a wash over the browbone area and at the inner corners and lined the lower lashline with the silver shade. 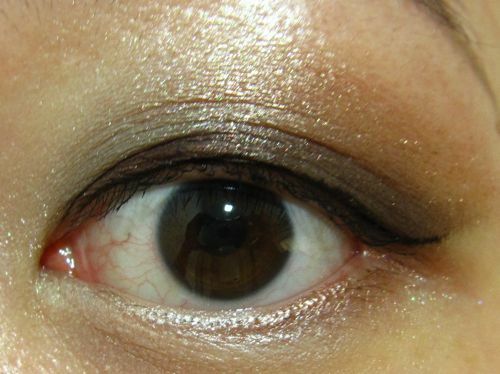 I also added a touch of the dark olive shade at the outer corner of the upper lashline but you can't really see it in the pics as most of it ended up being covered up by the Hourglass Calligraphy Liquid Eye Liner in Cognac. 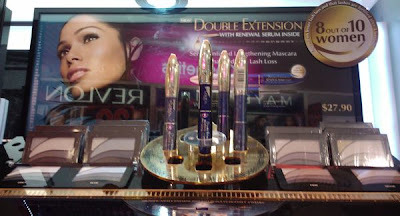 I finished by applying Visee Wide Impact (Curl Long) mascara in BK002 Blue Black. 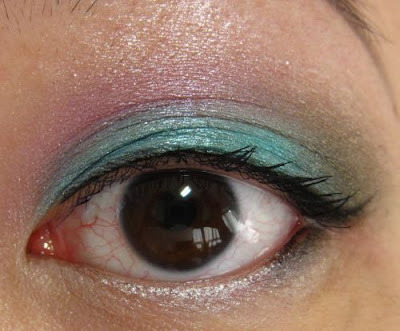 The key to this look is to blend the edges between the different shades so that there is a smooth gradational effect. 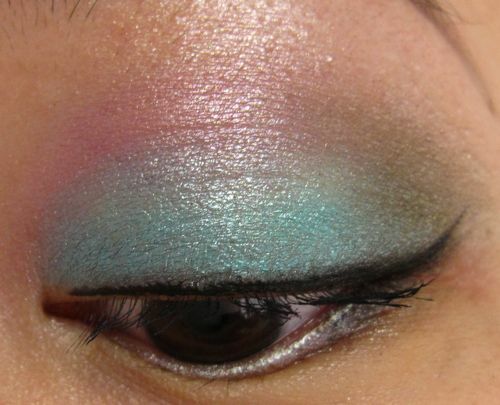 I use the MAC mini shader brush #228 (middle brush in the pic below) to apply the blue and teal shades. Then I use the MAC #224 blender brush (right) to lightly apply the purple shade in the crease and then blend the edges between the different shades. I also like using the #224 blender brush to apply shades that have a tendency to be too frosty, like the light beige shade. 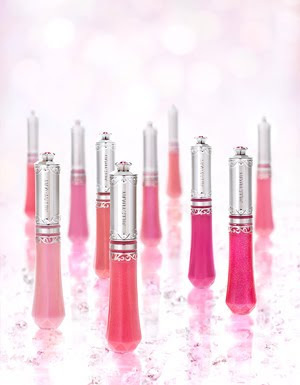 The #224 brush gives a diffuse, sheer finish so you get more of a pearlish glimmer rather than an icy frostiness. 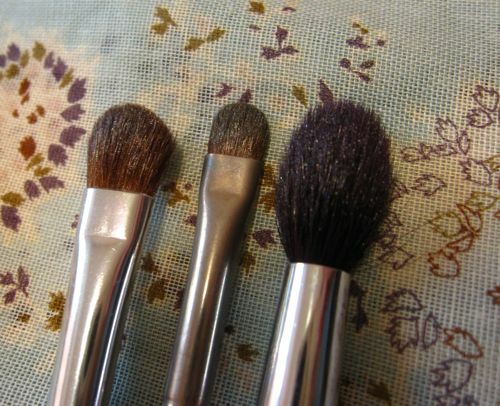 The MAC #213 brush (left) is also very useful for applying shades when you want a more pigmented finish. The #228 brush is for more precise work, like along the lashline. My #213 and #224 brushes are "Special Edition" versions from a holiday brush set that I purchased around 2001. MAC brushes that come as part of a set are marked with "SE" and are not as good quality as the regular brushes. Nevertheless, these two SE brushes have lasted very well through all these years with regular washing with the MAC brush cleanser. The #228 brush is from the regular line-up and one of my staples. For the rest of the look, I used Lancome Teint Miracle Liquid Foundation O-03 topped with Cosme Decorte AQ Face Powder N 001, Dior Skinflash, K-Palette Real Lasting Eyebrow 02, Beauté de Kosé Rouge Fantasist PK891 Raspberry Pink and Esprique Precious Gradation Layer Cheeks 01 Coral Red. 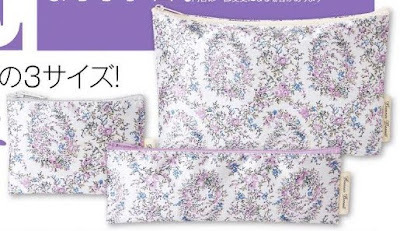 Here's a list of upcoming Japanese magazine freebies. The release dates listed below are for Japan so please check directly with Kinokuniya if you wish to know when exactly they will arrive in Singapore. Kino's air shipments usually arrive on Wednesdays and Fridays but this is subject to changes (e.g. due to public holidays in Japan). 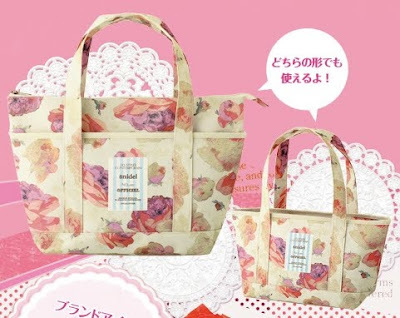 Steady (7 Jan): February issue comes with a L'Est Rose A4-size bag (29x38x8cm). See the video clip here. 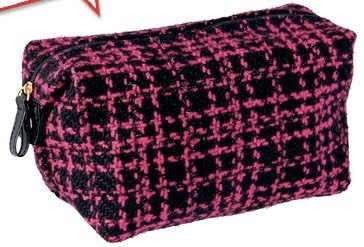 InRed (7 Jan): February issue comes with a Beams tweed pouch (24x12.5x9cm). See the video clip here. Sweet (12 Jan): February issue comes with Snidel two-way tote bag (26x40x13cm). The top part can be folded into the bag to make it a more compact size. 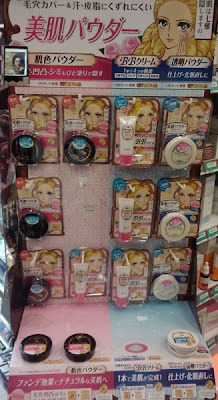 This is Snidel's first collaboration item with Sweet. See the video clip here. 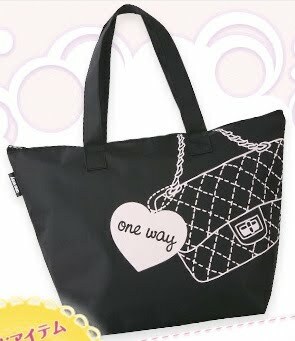 Cutie (12 Jan): February issue comes with One Way zip bag (28.5x42x15.5cm). See the video clip here. 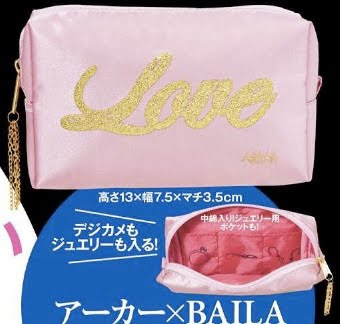 Baila (12 Jan): February issue comes with an Ahkah pouch (13x7.5x3.5cm). Ahkah is a Japanese jewellery brand. Nonno (20 Jan): March issue comes with Hello Kitty crystal-studded earphones. 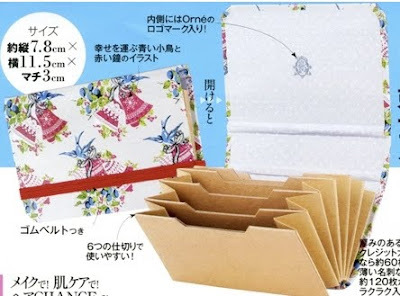 Mina (20 Jan): March issue comes with an Orne card case. 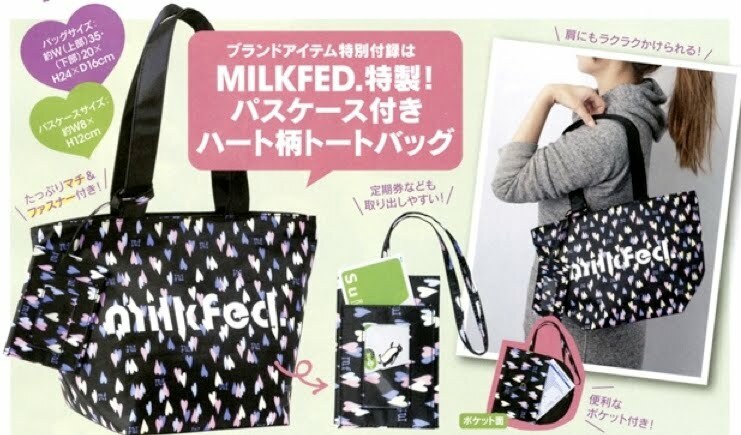 Spring (22 Jan): March issue comes with Milkfed tote bag (35x24x16cm) and card case (8x12cm). Spur (22 Jan): March issue comes with a 3.1 Phillip Lim pouch (20x25cm). 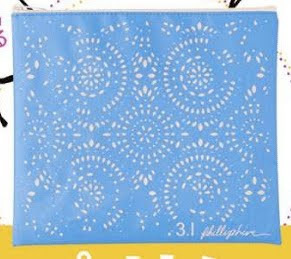 More (28 Jan): March issue comes with three Banner Palette zip pouches. 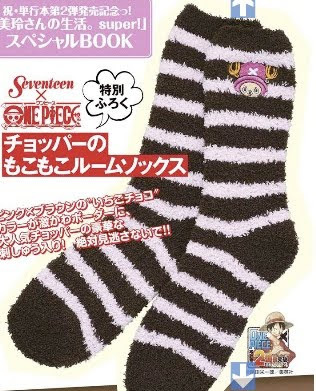 Seventeen (1 Feb): March issue comes with One Piece room socks. 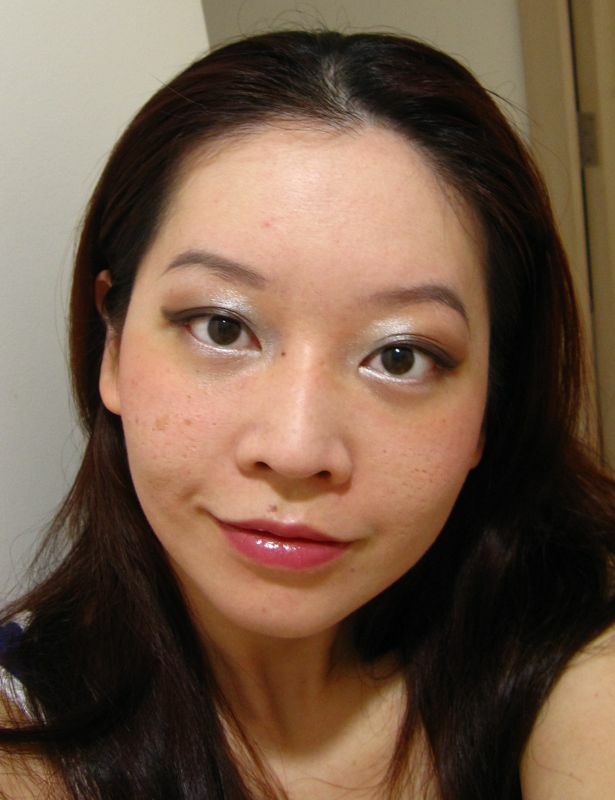 Decided to do a brown-themed look with the more sedate half of the Sleek Curious i-Divine Palette today. After applying Urban Decay Primer Potion as the base all over the lid, I applied the rich chocolate shade from the upper lashline to the crease, the silver grey shade at the inner half of the crease, the light brown shade just above the outer half of the crease and the outer half of the lower lashline, the white shade as a wash over the browbone area and along the lower lashline. 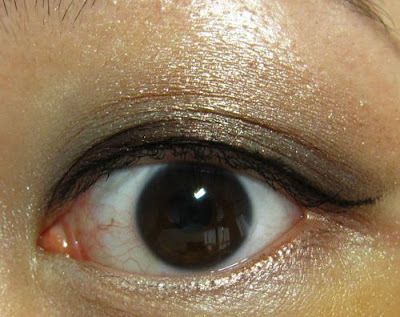 Next, I used Hourglass Calligraphy Liquid Eye Liner in Cognac to line the upper lashline and applied Clinique High Impact Mascara 01 Black. Unlike my usual Visee mascara, the Clinique mascara does not hold up the curl of my lashes well but it is so much easier to remove than the ultra tenacious Visee mascara. With the Visee mascara, I have to use a cleansing oil while the Clinique mascara comes off almost instantly with Lancome Bi-facil. 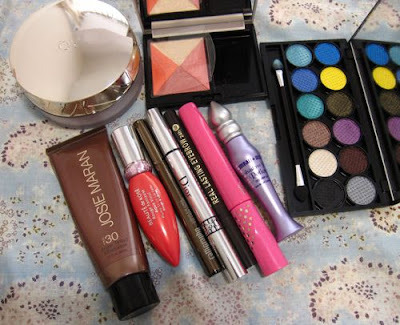 The rest of the products are virtually the same as yesterday, namely Josie Maran Tinted Moisturizer in Creme topped with Cosme Decorte AQ Face Powder N 001, Dior Skinflash, K-Palette Real Lasting Eyebrow 02 and Esprique Precious Gradation Layer Cheeks 01 Coral Red. On the lips, I am wearing Paul & Joe Lipstick CS #63 Cruising from the fall 2009 collection. 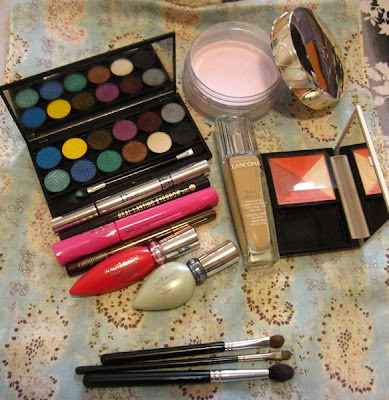 Of the four eyeshadows, I found all of them to be well-pigmented and easy to blend. The deep chocolate shade was the most impressive with a luxuriously rich metallic finish. The white shade looks overly frosty though if applied heavily. Overall, I think that Curious is one of Sleek's most versatile palettes (provided that you like blues and greens) and could well become my favourite out of the 9 that I currently own. It is no longer available on the Sleek website but you can still find it on Ebay. Received my second ASOS.com order today! Taking advantage of the free international shipping promotion before Christmas, I placed the order on 9 December and it shipped on the same day. I'm always amazed by how fast it takes ASOS to process orders. 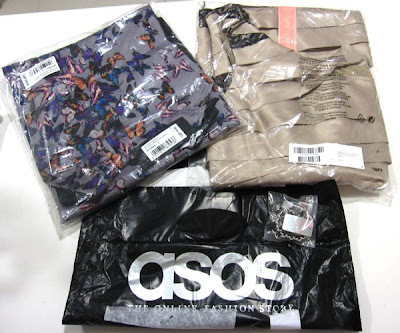 It looks like ASOS has also reduced its shipping rate to Singapore. It used to be a flat rate of £10.50 but it is now only £5 for international standard delivery to Singapore, which takes about 11 working days. You can see the shipping rates here. My order comprised two dresses and a bracelet, all individually packed inside a black shopping bag. 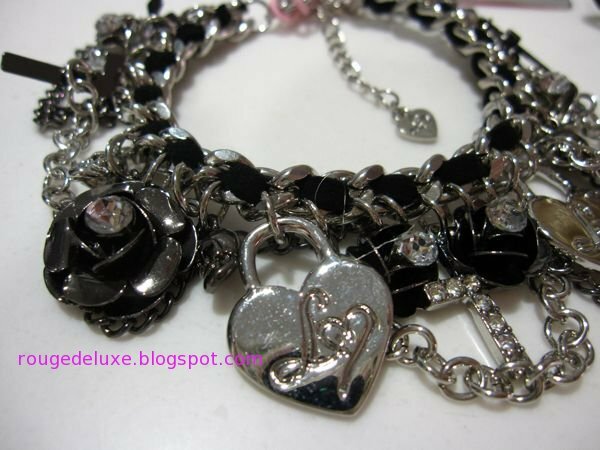 The bracelet is from Lipsy. 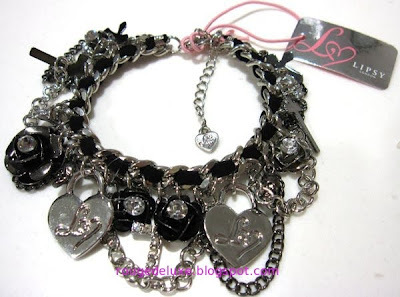 I don't usually wear chunky bracelets but I liked the mix of charms on this. The one shoulder dress is also by Lipsy. I've been shopping for a tiered design like this. What drew me to this dress was the delicate black lace inserts. This is currently on sale at £36, down from the original price of £60. 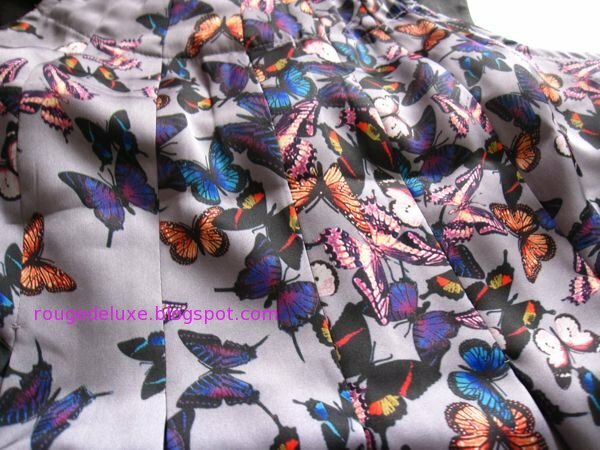 The butterfly print dress is by Ted Baker. 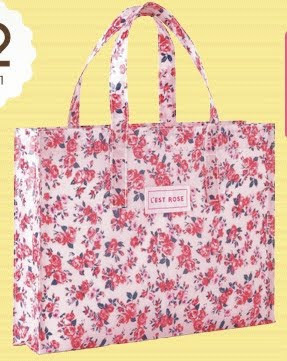 I love browsing in the Ted Baker stores in Singapore but like Karen Millen, the prices always deter me from purchasing anything. This was originally priced at £149 but I got it on sale at £119. It is now only £74 on ASOS but with only size 4 left. 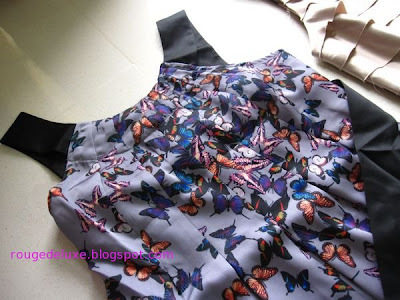 I like the simple cut of this dress with the pleated neckline, and the vibrant mix of colours. Accompanied my friend to Uniqlo at Ion Orchard this afternoon and the new collection of "Sweet Illustrations" T-shirts caught my eye. 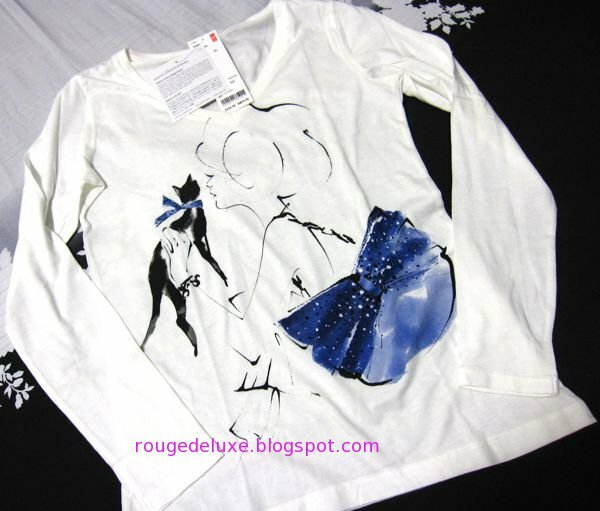 Featuring designs by 5 Japanese illustrators, the long-sleeved cotton T-shirts retail at 1500yen in Japan and S$29.90 in Singapore. You can view the whole collection on the Uniqlo Japan website. 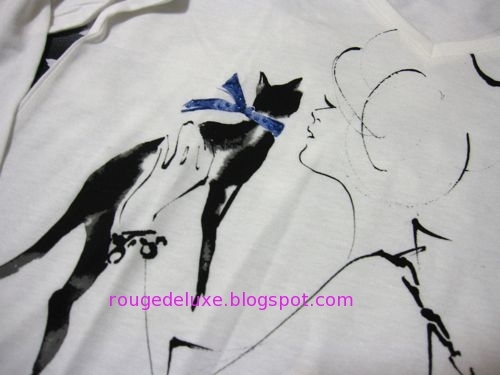 The ribbon around the cat's neck is studded with crystals. This particular design is also available in grey but the white version shows off the illustration much more clearly. About the illustrator Yoco Nagamiya. Love the illustration on the hangtag too! The Jill Stuart Lip Jewel and 2011 Spring Collection special website can now be viewed here. 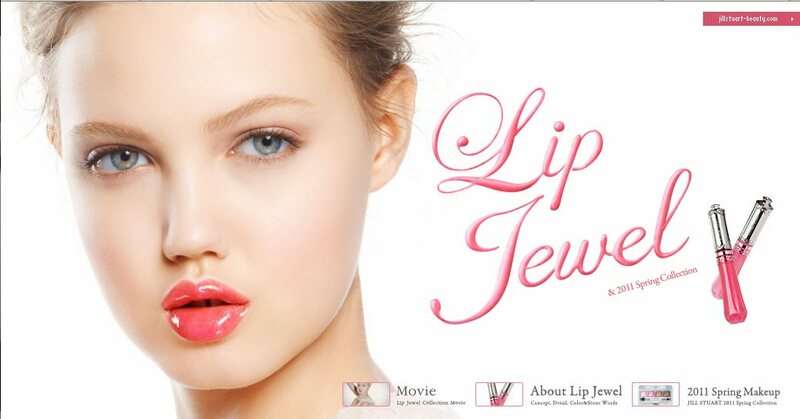 There's a short video clip of the model using the new Lip Jewel lipglosses. She is wearing Jewel Crystal Eyes 07 Sweet Amethyst, Lip Jewel 01 Catseye Wink and Blush Blossom 06 Little Anemone. The Lip Jewels have a "crystal floral bouquet" scent and contain moisturising ingredients like almond oil and rose extract. 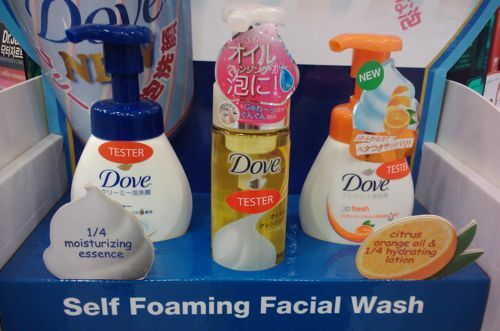 They have a flocked sponge applicator. 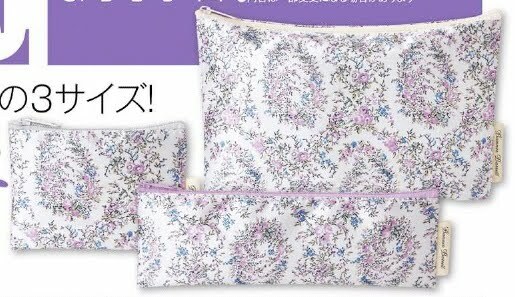 For Jill Stuart members in Japan, if you spend at least 70,000yen from April 2010 to March 2011, you will receive the exclusive Beauty Tray Collection below sometime in April 2011. Isn't it gorgeous? As this year winds down through its final week, I've been reflecting on the year gone by. As I was telling my best friend the other day, 2010 felt like the year in which everything finally fell into place for me. I couldn't have asked for a better year to close out this decade, which has seen me go through some truly tumultuous times. It feels deeply satisfying to finally shed the insecurities and uncertainties of my 20s and grow comfortable in my own skin. Much of my 20s were spent agonising over whether I'd ever meet the right person, what I should do with my life and whether I'd ever be any good at what I do. Being naturally quite reserved, I've never been the kind of person who makes friends easily. Throughout my 20s, it seemed like with each passing year, my circle of friends grew smaller. However, in my 30s, I was surprised when new friends came into my life and we bonded easily and strongly. Similarly, just when I'd given up hope on meeting someone, I met my husband and we got married in March this year after just two years of dating. Life and people will surprise you that way. Sometimes, all it takes is being in the right place at the right time (and always treating the people around you with kindness and graciousness will go a long, long way too). So, ladies who are dreading turning 30, do try to keep an open mind because your 30s could turn out to be much more interesting than you anticipate. I know that I've been very blessed, and I give thanks every day for it. Blog-wise, it has also been deeply gratifying to watch my readership grow organically to where it is today. Long-time readers would know that this year, I started to show my face on the blog and hopefully, that has made the blog more personable and useful. (If you detest my face, I don't know why you are reading this but I do hope for your sake, that you find something more productive to do with your time soon!) My sincere thanks to my regular readers for stopping by and sharing your thoughts with me through the comments. 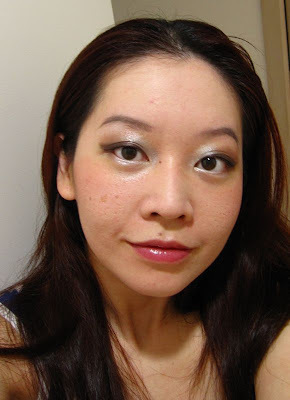 2010 was the year that beauty companies in Singapore actively started to engage the blogging community and so I had the chance to attend several events. These have been on the whole quite fun and it was definitely an eye-opener in terms of getting to know the rest of the local community of beauty bloggers, ladies from all walks of life and professions with one shared love of everything beauty-related. Naturally, not everyone is peaches and sunshine but well, they do provide the best stories! For 2011, my only wishes are that my mother's cancer will continue to stay in remission (it's 2 years and counting now) for decades to come, and for the safety of my husband, who likes to visit countries that give me nightmares. 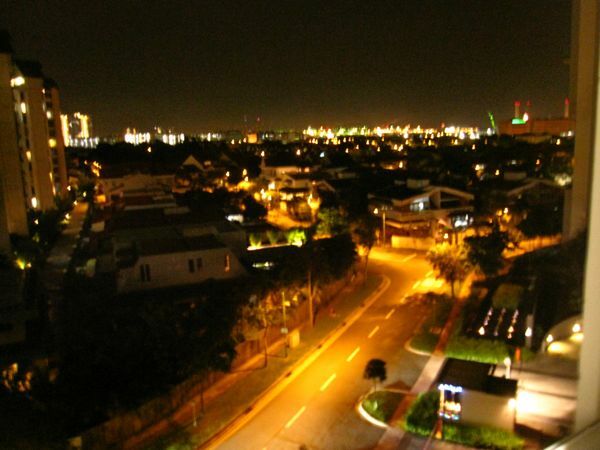 To my readers, I hope that 2011 will bring you buckets of warm love and laughter, wherever you are. Watsons is currently having a sale, with the usual 20% discount on beauty brands like Kate, Majolica Majorca, L'Oreal, Maybelline, Bourjois, Fasio, Canmake, Revlon, Rimmel and Za. The sale will be on until 12 January. 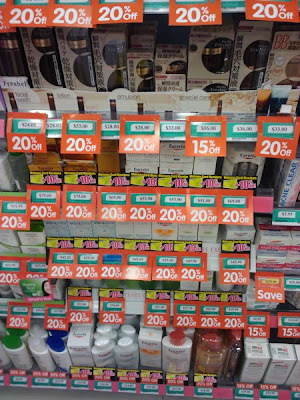 You can check out the list of brands on sale here. I also spotted some new products at the Watsons in Ion Orchard earlier today. 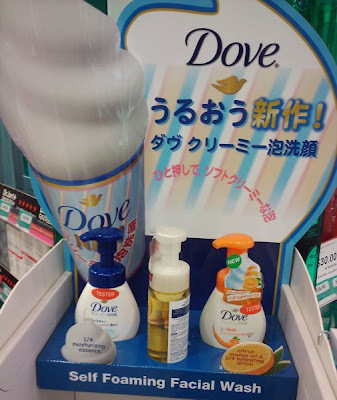 The Dove Lathering Oil Makeup Remover is on sale at S$14.60 while the Creamy Lather Facial Wash and Fresh Lather Facial Wash are S$11.95 each. New Rimmel Great Curl Volume Mascara (S$19.90) with Ayumi Hamasaki as the spokesmodel. 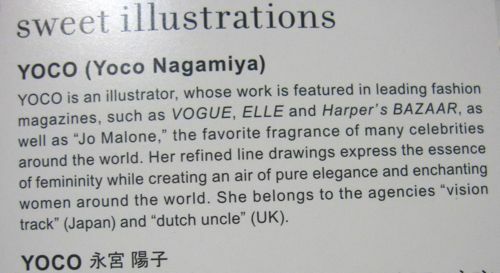 The mascara is made in Japan. 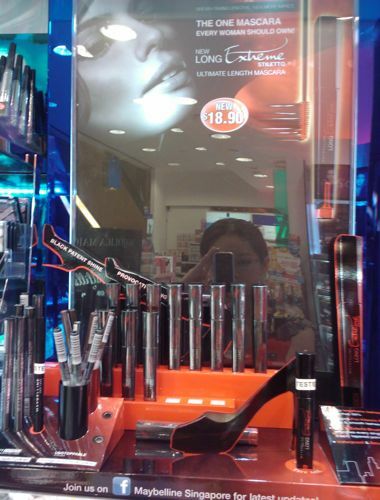 New Maybelline Long Extreme Stiletto Ultimate Length Mascara (S$18.90), which is made in China. Revlon New Complexion 2-Way Whitening Foundation (S$29.90). L'Oreal Double Extension Serum Infused Lengthening Mascara and new eyeshadow quads. 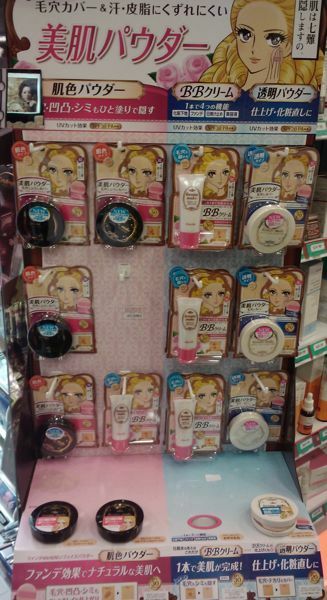 Heroine Make BB Cream and pressed face powders. 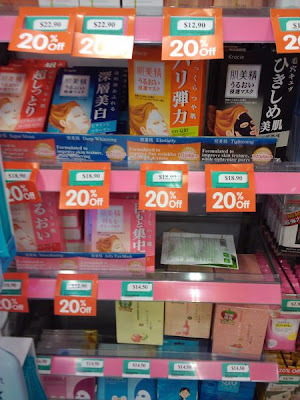 Some of the brands on sale. I stocked up on Gatsby oil blotting sheets (15% off), K-Palette Real Lasting Eyebrow 01 (15% off), La Roche-Posay Effaclar K (20% off) and Lucidol-L Hair Jelly (Swing Keep) (think this was 15% off). 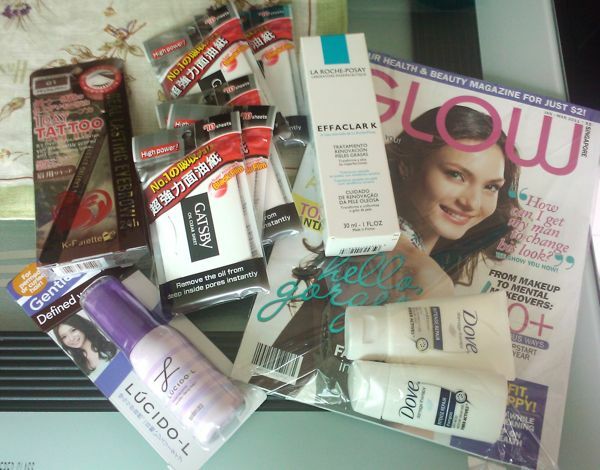 Also picked up the latest issue of Glow (S$2) magazine which comes with sample sizes of the Dove shampoo and conditioner. 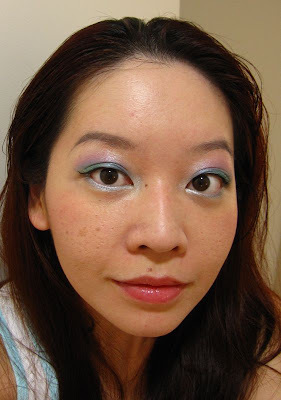 Sleek Curious i-Divine Palette is a limited edition palette that was released in August 2009. It is no longer sold on the Sleek website so Ebay is pretty much your best bet of snagging this palette if you are interested in it. 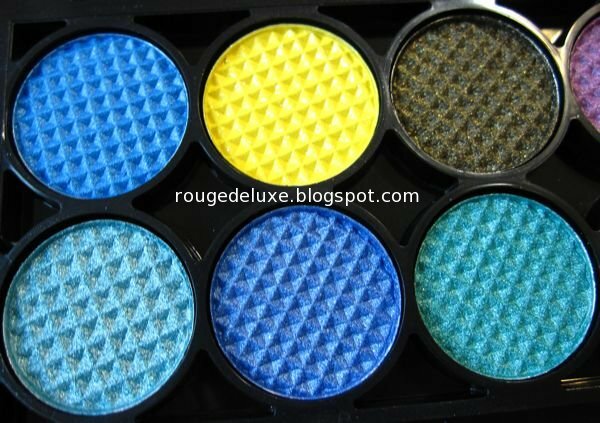 You can easily find swatches of all the shades in the palette on other blogs. 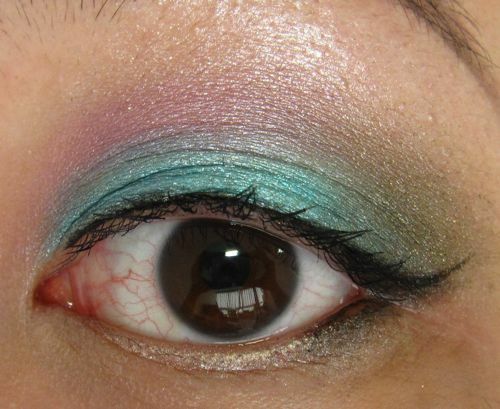 Using Urban Decay Primer Potion as the base all over the lid, I applied the light blue green shade (bottom left in the first pic above) from the inner corner to the middle of the lid, the medium green (bottom right in 1st pic) in the middle of the lid and blended into the dark olive shade at the outer corner. Next, I brushed the whitish beige shade over the browbone area and along the lower lashline, and the black shade along the outer corners of the upper and lower lashline. 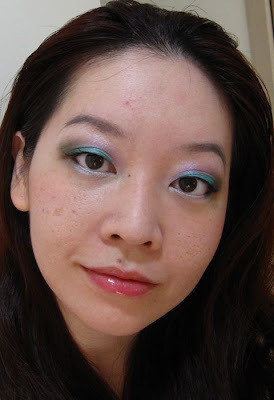 I finished by applying the purple shade at the inner half of the crease, using Hourglass Calligraphy Liquid Eye Liner in Cognac to line the upper lashline and applying Visee Wide Impact (Curl Long) mascara in BK002 Blue Black. 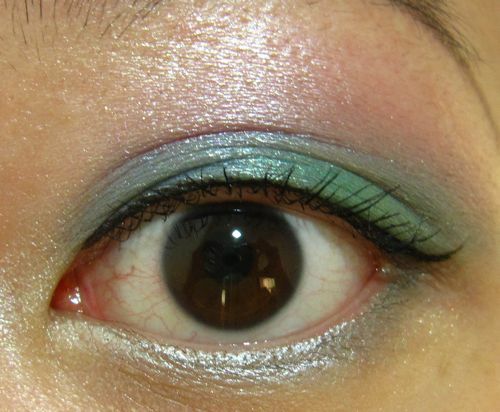 The only eyeshadow that caused quite a bit of fallout during the application process was the black shade. The fallout was so tenacious on my under eye area that I had to use a makeup remover-soaked cotton bud to wipe it off. Nevertheless, I liked how the green shades worked very well together and did not have any ashy tones. As usual, the eyeshadows are well pigmented, easy to blend and require very little effort to produce a lovely metallic finish. They also last well without fading or creasing, thanks to the UDPP. Sleek eyeshadows are very soft and do tend to kick up a fair amount of powdery bits when you run your brush across the surface so it's best to use a light hand, otherwise your palette could end up being very messy with cross-contamination amongst the shades. For the rest of the look, I used Josie Maran Tinted Moisturizer in Creme, Cosme Decorte AQ Face Powder N 001, Dior Skinflash, K-Palette Real Lasting Eyebrow 02, Beauté de Kosé Rouge Fantasist PK891 Raspberry Pink and Esprique Precious Gradation Layer Cheeks 01 Coral Red. I paid £11 for Curious, including registered postage from the UK to Singapore. 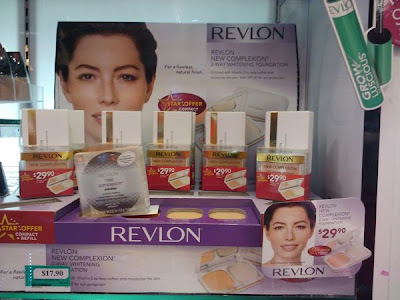 That's slightly double the original retail price but still a pretty good deal for me, as the dozen shades in it are shades that I can see myself using frequently.